We offer many different massage techniques. They all aim to help you relax deeply. Discover everything we offer on this page. The gentle, humid heat in the steam bath unravels tension, inviting you to relax all your muscles. The steam bath offers many benefits to both body and mind. “Champ de l’être” offers a wide selection of massages from which you can choose. A few examples are the balinese, californian, chinese, and indian massages. We also offer “mother to be” and “baby” massages. In our society and culture, we are not often touched. It may not even happen everyday. However, being touched is extremely important: we live, work and love with our bodies. Our bodies allow us to communicate beyond a verbal level. Despite cultural reticence, it is perfectly possible to include touch in an urban and western lifestyle. All the different types of massages we offer are often linked to traditional culture and medicine from China, Thailand, Japan, India…). Please contact our team for more information. Massage is one of the most ancient forms of popular therapies, and has been used throughout history to heal the body and mind. 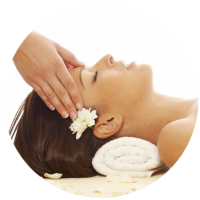 For thousands of years, different types of massages have helped to heal and soothe illnesses. Its occidental origins can be traced back to Antiquity, some 3000 years BC. Antique Greek and Roman doctors primarily used massage to heal and soothe. The word “massage” entered the dictionary in the nineteenth century. Its meaning can be found in the greek “masseen”, hebraic “mashesh” and arabic “mass”, which mean touching, kneading, pressing lightly, and palpating. In India and throughout Asia, massage is a part of everyday life and represents a lifestyle, a special moment for relaxation. The Abhyanga is a 1 hour 30 massage that profoundly relaxes body and mind. Its consecutive and deep rhythm revitalises you, stimulates blood and lymphatic flow, and mobilises toxins. For further “deap cleansing”, treat yourself to the steam bath, where more toxins are released through perspiration. This deep and unifying cocooning massage eliminates tension and prevents increasing fatigue. A special and unforgettable moment for Mummy and Baby. This massage can be received from the beginning until the end of the pregnancy, and can be done in a lateral position. Create your own relaxation program, adapted to your needs, to your budget, and to how many people you are. Whether you are alone, or in group, treat yourself to our formulas for a uniquely luxurious moment. A PROJECT IN MIND? CONTACT US!